Potatoes are, clearly, the best vegetable. I know that potatoes are a carb and that if I want to be skinny by summer I should probably steer clear of them, but I just can’t help myself. Baked, scalloped, mashed, it doesn’t matter. I. Love. Potatoes. Besides carby goodness, I also love couponing. Sunday morning are my favorites because I sit down with the inserts from the paper and cut coupons while looking for the best deals in the local ads. It’s an addicition. My cousin Lexi, who I talk about a lot in this blog and who is the #1 fan of my culinary talents, often teases me about my love of coupons but then loves to go with me and watch me use them to get stuff for totally free. I read blogs about it as well and a few weeks ago I discovered a program called Ibotta. Ibotta is an app you can download for FREE on your phone that will give you dsicounts on items you purchase at the grocery store. You simply do the tasks on that item like answer polls or watch short videos. Then you take a picture of the receipt and scan the barcode of your item to make sure it matches. If it does, Ibotta rewards you the money into an account that you can transfer to PayPal. So essentially they act like coupons. So when I saw an Ibotta offer for Tyson’s Grilled and Ready Chicken strips, which were on sale at Target and I had regular coupons too, I bought a ton of them. It’s a win win because now I’ll be making a ton of grilled chicken recipes! You don’t need the strips to make these. Just cut up a chicken breast into chunks. Easy weeknight dinner! Wanna check out Ibotta? Go here. 2. Using a fork, poke holes into the potatoes. Place them on a baking sheet lined with aluminum foil and bake for 1 hour. 3. Let the potatoes cool for 5 minutes. Slice each potato down the center. In a small bowl, scoop out the insides out each potato. It’s easier to do one potato at a time, that way you have even proportions for what goes back inside each one. 4. 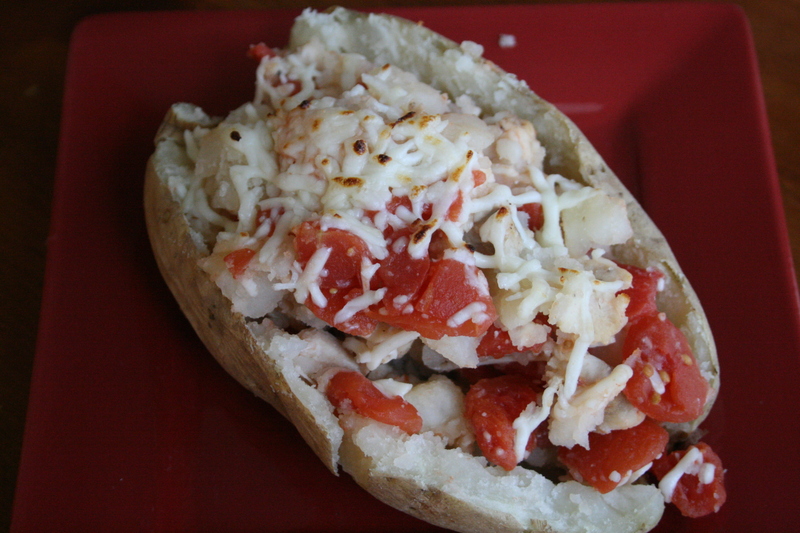 Mix the potatoes with cheese, tomatoes, and chicken. 5. 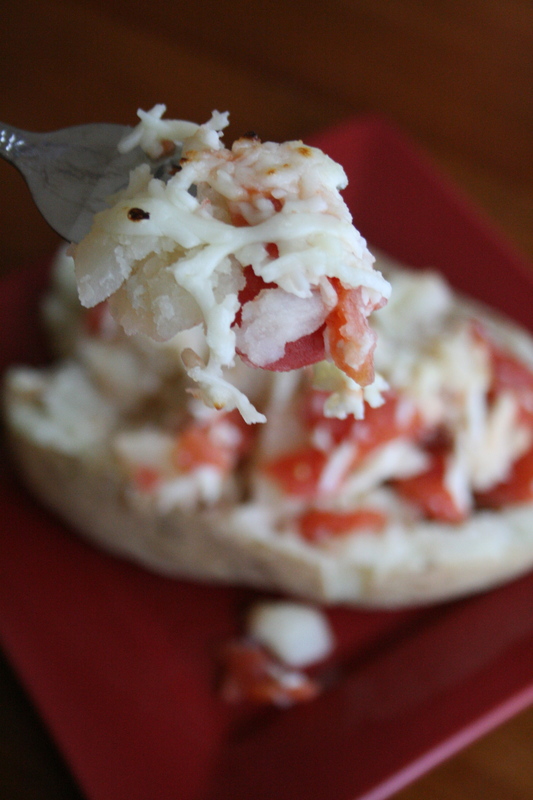 Sprinkle the top of each potato with a little extra cheese. 6. Set your oven to broil. Place potatoes back in the oven until the cheese melts. This should take about two minutes. 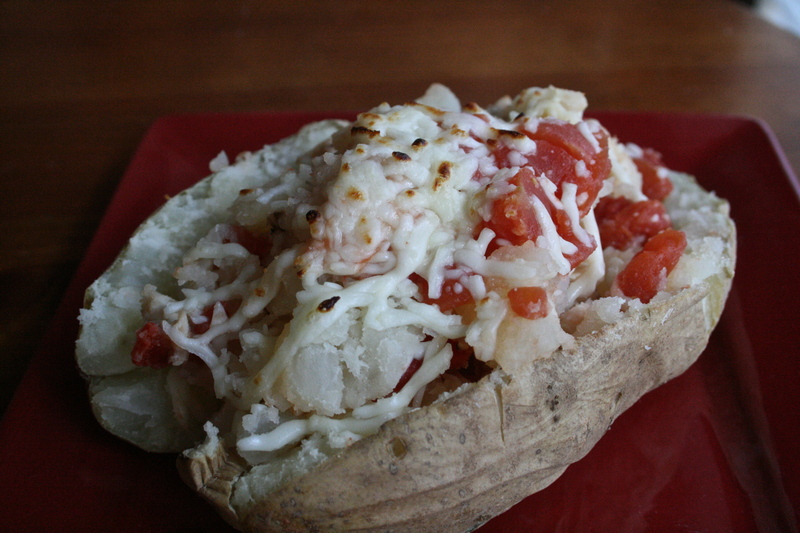 This entry was posted in Main Dishes and tagged baked potato, cheese, chicken, poatoes, tomatoes, vegetable. Bookmark the permalink.